Many travelers had translated Homer’s words on Thebes in the schoolroom, and coming to Luxor was a high point of their travels. Pierre Loti found tourism had spoiled it for him; the magnificence of Kamak silenced Amelia Edwards; across the Nile, the isolated Valley of the Kings and its tombs awed the travelers. Thebes old Egyptian Thebes what strange ideas does the word conjure up! It was very different from any of my conceptions, and its real character is best told by saying that it is strangely old and strangely interesting. I had most reluctantly passed it on our upward voyage, and now it was with feelings of an intense kind that I put my foot for the first time on Theban soil. 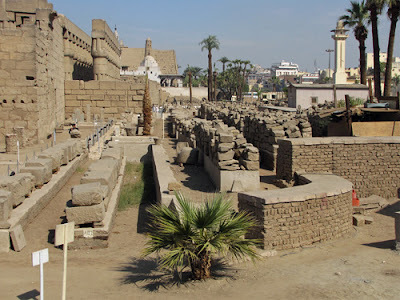 We now returned to Luxor, and having seen every thing we began to think of returning. I cannot quit Thebes, however, without a few observations most travellers, when speaking of this ancient capital, make mention of the lines of Homer, wherein he alludes to Thebes in such glowing characters. I shall give you Alexander Pope’s translation of the passage, and then add a few observations which occurred to me on the spot. From each wide portal issuing to the wars. In our researches throughout the whole of the Theban ruins we could not meet within any remains of either walls or gates, unless the term is applied to the pylons and other buildings which constitute the approach to the sacred edifices. Captain Frederick Norden and his company were not welcomed on their arrival in Luxor. Matters were very different a century and a half later.